For our pickup selection modifications we don't utilize push/pull or push/push pots which are quite typical and unoriginal and we don't mount our mini-toggle switches in holes drilled in the pickguard using the standard chrome flat washer and hex nut on the top side of the pickguard, that's also very typical and unoriginal. For this particular modification implementation we have custom routed two small 1/8" x 5/16" slots in the pickguard, custom designed a unique stainless steel mounting bracket to secure both of the mini-toggle switches in alignment with the two slots in the pickguard which is then fastened securely in place with the volume and tone potentiometers. This custom mini-toggle switch mounting bracket provides a recessed or lowered profile of both switches that only allows a small portion (approx. 1/4") of each switch lever to protrude through the top side of the pickguard. 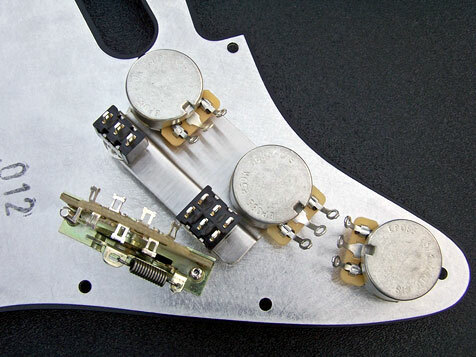 This is the same kit as installed in our Fat Strat® Project. 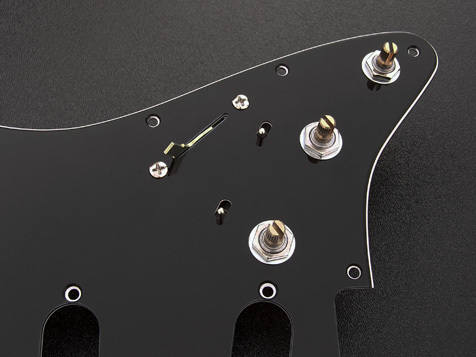 The HSS pickguards Humbucker pickup mounting are the standard Fender® 3 hole mounting style. Custom Stainless Steel Double Recessed Mini-Toggle Switch Mounting Bracket. Tone Capacitor - Orange Drop (Your choice of one of the following). Mini-Toggle Switches (Your choice of two of the following). IMPORTANT NOTE: If you are selecting your modification kit with one of the '62 vintage pickguards or '57 vintage pickguard they are unshielded as provided by Fender. To have the genuine Fender® aluminum '62 pickguard shield or '57 control area shield included please add it separately to the right using the appropriate "Add to Cart" button. The '62 vintage aluminum pickguard shield is a full pickguard coverage shield. The '57 vintage aluminum pickguard shield is a control area only shield. 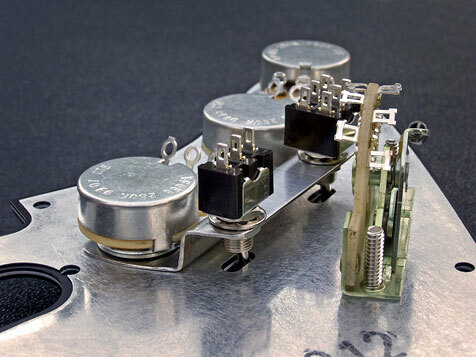 These shielding's are specific and authentic to how they were originally built by Fender® during the respective era with the obvious exception of the custom modification which allows the recessed mini-toggle switches to protrude through. The 2'nd DPDT mini-toggle switch can switch a Humbucking pickup's two coils from series or parallel. When selected in series it has the typical full Humbucking pickup sound, when selected in parallel it takes on a single coil pickup sound yet still retains the hum cancelling capability. This Humbucking pickup could be a single coil sized pickup which has that full Humbucking sound but in the small single coil pickup size package such as the Seymour Duncan SL59-1b bridge pickup. Another option for the one of the mini-toggle switches would be to use a SPDT switch where you could switch a tapped bridge pickup from low output to high output with a pickup such as the Seymour Duncan SSL-3T or SSL-5T. With a tapped pickup you can have dual output level selection options from one pickup depending on which tap is currently active. Yet another option for one of the mini-toggle switches would be to use a DPDT switch to perform a "Direct-Through" modification where the volume potentiometer is by-passed to eliminate any loss of signal it grabs. The signals from the pickups are then routed directly to the output jack. As you can see there are any number of pickup selection options that can be utilized, it's up to you and your creativity.